Adults who want straighter teeth, along with the boost in self-confidence that a beautiful smile can bring, have several treatment options. Most people are familiar with traditional braces and clear aligners—a removable and nearly invisible alternative. But there is another option that many don’t know about: lingual braces. Lingual braces are the most inconspicuous appliance available for orthodontic treatment today. You can’t see these braces at all. That’s because they go on the back (tongue side) of the teeth where they are completely invisible—even to the wearer. Otherwise they are basically the same as braces that go on the front of the teeth, consisting of a wire held in place by individual brackets. Any malocclusion (“mal” – bad; “occlusion” – bite) that can be treated with traditional braces on the front of the teeth can be treated with lingual braces on the back of the teeth—only the mechanics are reversed: A push with traditional or “labial” (lip-side) braces is a pull with lingual braces. Like all medical procedures, the various methods of orthodontic treatment have specific advantages and disadvantages that must be weighed before selecting one to use. Choosing which type of orthodontic appliance is best for a particular person, however, often comes down to lifestyle considerations—and that’s exactly what led to the invention of lingual braces. They were developed simultaneously by two orthodontists: one in Beverly Hills, who was looking for an invisible form of treatment for his very appearance-conscious patients; and another in Japan, whose patients were martial artists who could not safely participate in their sport with braces on the front of their teeth. 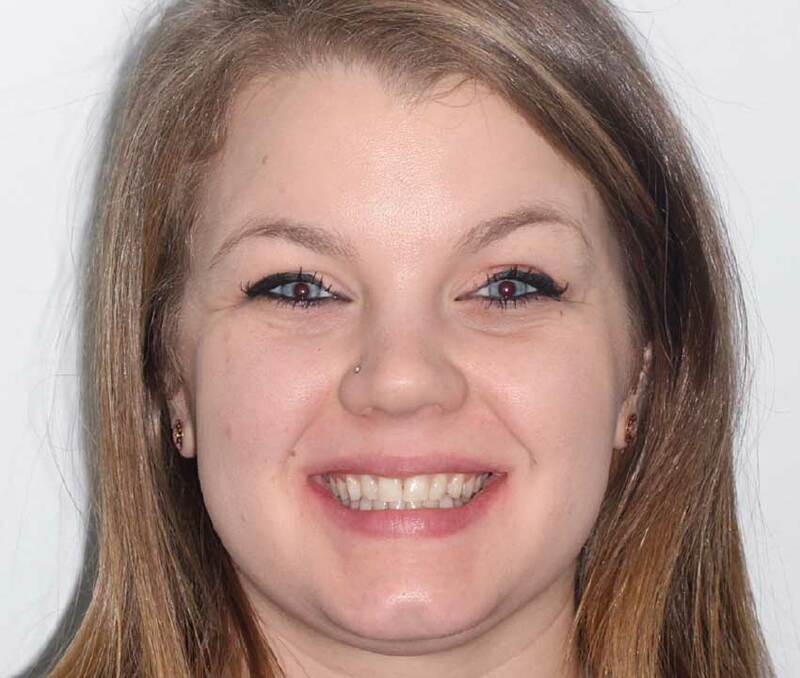 In my own practice, I once treated a police officer with lingual braces for a similar reason: He worked in a rough neighborhood and was concerned that labial braces would leave him vulnerable to mouth injuries during any physical confrontations. Braces placed behind the teeth would not cut into the inside of his lip if he happened to get hit in the face. Others opt for lingual braces for less dramatic reasons. It’s a good solution for people who have dental veneers, which are porcelain tooth coverings on the front surfaces of the teeth that can be damaged by contact with braces. People who snack frequently or have food-related jobs may be inconvenienced by clear aligners, which must be removed for eating. People who tend to worry about germs may also find aligners unappealing because of the constant need to place their hands in their mouths to take the appliances in and out. So what are the disadvantages of lingual braces? For one thing, they often cost 15-35 percent more than traditional braces. They are also harder to get used to because of their constant contact with the tongue. Upper lingual braces will initially affect speech, while lower lingual braces affect tongue comfort. Most people tend to get used to them within a week, but success depends on knowing what to expect. No one should go into this believing it’s going to be all gumdrops and rainbows! 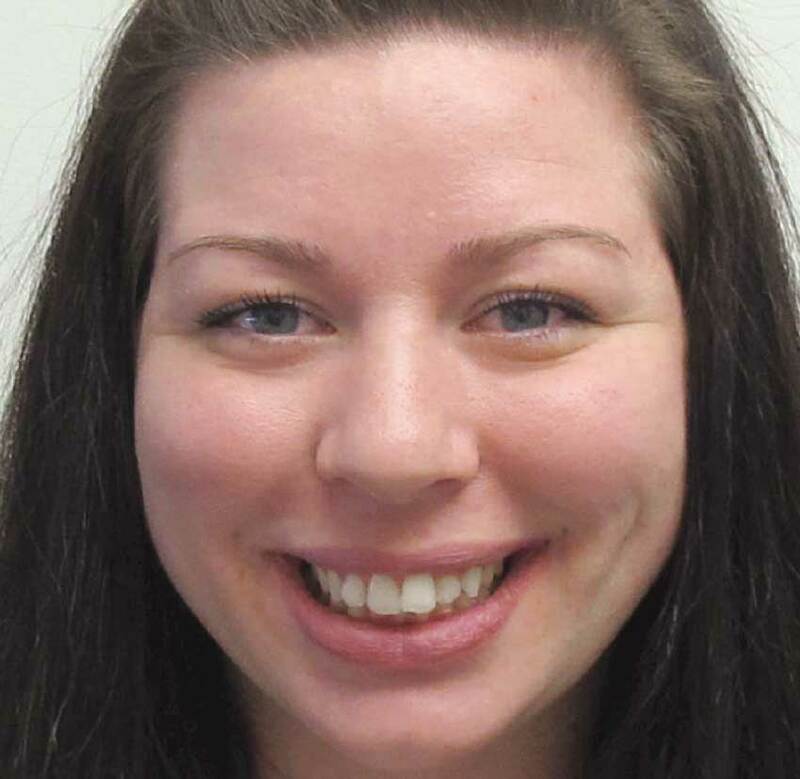 Can you tell if this patient is wearing braces? She is, but you can’t see them because lingual braces are placed on the tongue side of the teeth. A significant number of lingual braces patients experience “buyer’s remorse” within the first 48 hours due to the discomfort. After those first two days, most start feeling better. Within a week, they realize that they can definitely stick with it. By the end of the first month, they start seeing changes to their smiles and get really excited. That’s because, unlike people who wear braces on the front of their teeth, these folks can actually look in the mirror and see the progress well before their braces come off! In fact, lingual patients are often so enthusiastic about their treatment, they like to show their braces off—pointing the appliances out to others and saying things like, “Did you know they even have these?” This is a fascinating paradox, considering that invisibility was the main reason they wanted this type of treatment in the first place! 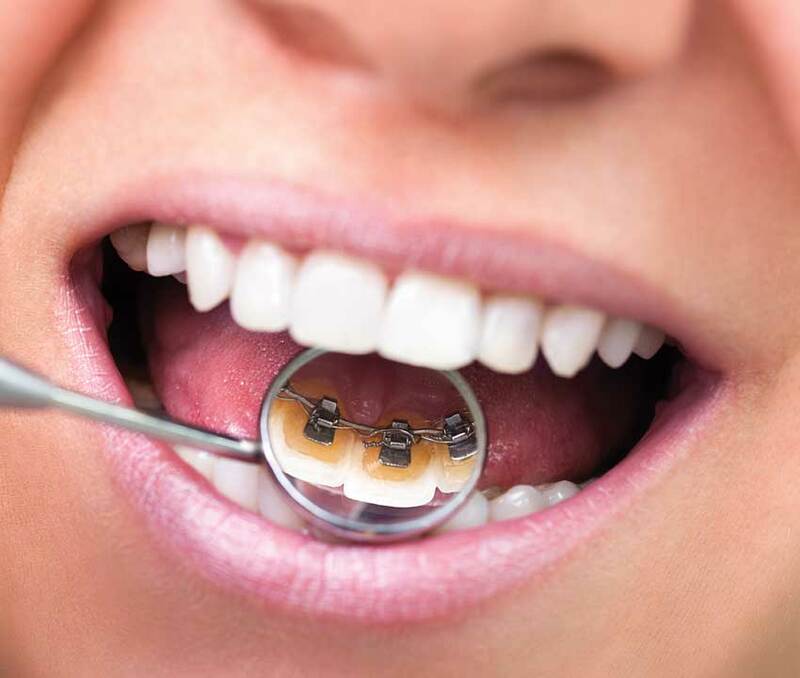 Treatment with lingual braces starts the same way as any other teeth-straightening treatment does: with a diagnostic workup to determine where the teeth should be and how they need to be moved to get there. This includes taking photographs inside and outside of the mouth, and x-rays to determine where the teeth are in the jaw and how the face and jaws are proportioned. A 3-D model of the teeth also needs to be created; it can be done virtually with a digital scanner, or physically with putty-like impression material. These records help your orthodontist plan exactly where the brackets on each tooth will go, as this placement will affect how each tooth moves. The bracket functions as a handle on the tooth. Where you grab the tooth determines how it moves. Think of it this way: If someone is facing you and you pull on his nose, he will come straight towards you. If you pull on his ear, he will still come towards you but his head is also going to turn. Likewise if a bracket is not placed exactly in the middle of the tooth, it causes the tooth to rotate. This concept can also be used to make teeth more visible in the smile by positioning brackets higher or lower on the tooth, to move them in a vertical direction. The personalized braces arrive from the lab in a tray that looks like a mouthguard or clear aligner, ready to be placed on the teeth by the orthodontist. 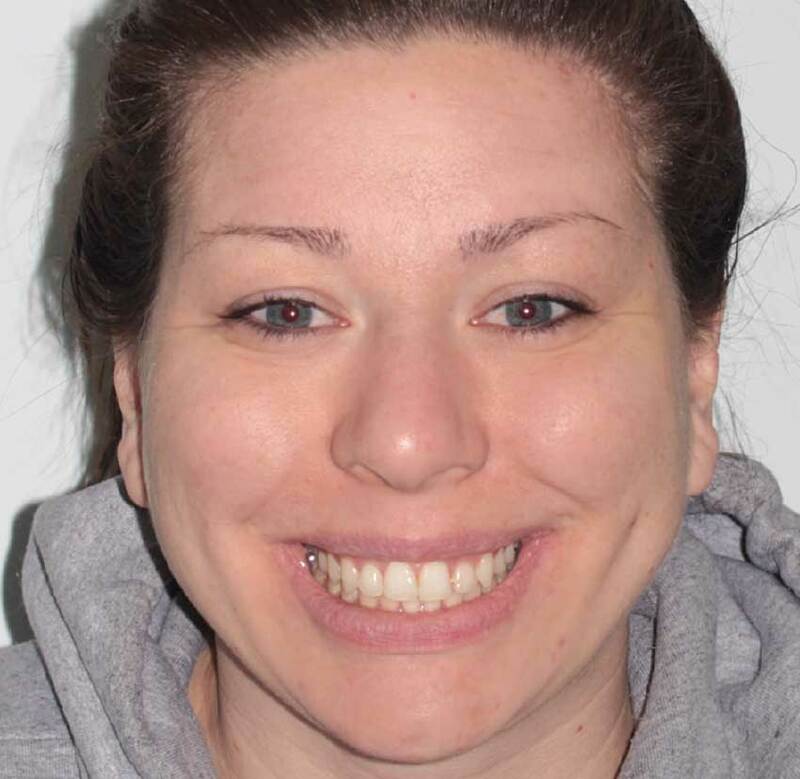 After the brackets are bonded to the back sides of teeth, the tray is removed and presto: invisible braces! As you can see, positioning brackets on the teeth is a very important part of the process. But here’s where we get to the major difference between placing lingual braces and placing labial braces: While it’s very easy to position labial brackets, it’s very difficult for a dentist to get a good view of every tooth from the tongue side. So rather than bonding the brackets directly to the teeth one by one and risk misplacing any, the orthodontist will have the braces custom fabricated on the 3-D model at a dental laboratory. This extra step is a big part of the increased cost relative to labial braces. 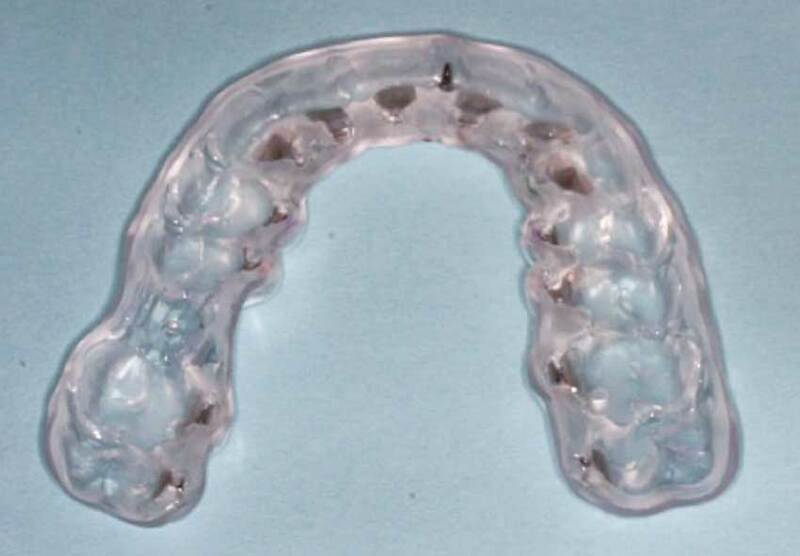 The personalized braces arrive back from the lab in a tray that looks like a mouthguard or clear aligner. Your dentist will first clean and dry your teeth, and put a bonding agent on them. The tray with the braces is then placed in your mouth. The braces are left to set, sometimes with the aid of a curing light. After a few minutes, the tray is peeled back and the braces are on the teeth! There is actually one lingual treatment method that may not require costly lab work: “limited lingual braces.” This is a particularly appealing option for adults who have had braces in the past, but whose lower front teeth have become crowded together again. This type of relapse is a natural aging process, like getting wrinkles. Limited lingual braces do not extend all the way to the back molars; they only go between the canine teeth (the pointy ones on each side). This is generally a very economical option that can be much less expensive than clear aligners—and actually quite comfortable and easy to get used to. Whether you get limited lingual braces or a full arch of braces from molar to molar, you often end up with one brace very close to the next, which can be quite difficult to keep clean. Water flossers, which spray a pressurized stream of water from a small handheld electronic device, are a huge help in this regard. It’s also a good idea to add extra professional teeth cleanings during each year of orthodontic treatment, no matter which appliance is chosen (usually every two or three months for adults). At the beginning of orthodontics using lingual braces with the teeth in malocclusion. As treatment is nearing completion, the patient can actually see the final result while the lingual braces are still on the teeth. There are many other steps you can take to make the experience of living with lingual braces easier. Simple over-the-counter pain relievers like ibuprofen or acetaminophen can ease the initial tenderness from tooth movement. Grandma is usually right and in this case, she would recommend warm saltwater rinses for any scratches to the tongue and cheeks. You’ll also find that your new best friend is orthodontic wax. These strips of malleable wax are used to cover the appliances as your tongue gets adjusted to them. These steps, a little time and proper planning by your orthodontist can get your journey to hidden treatment started off on the right foot. The amount of time it takes to straighten teeth is the same whether the braces are on the front of the teeth or the back, and is determined by the complexity of the required tooth movement. An individual whose teeth need limited work might take just several weeks, whereas a complex situation aimed at avoiding jaw surgery may require over two years of treatment. Most adults, however, wear their braces for about a year to a year and a half. 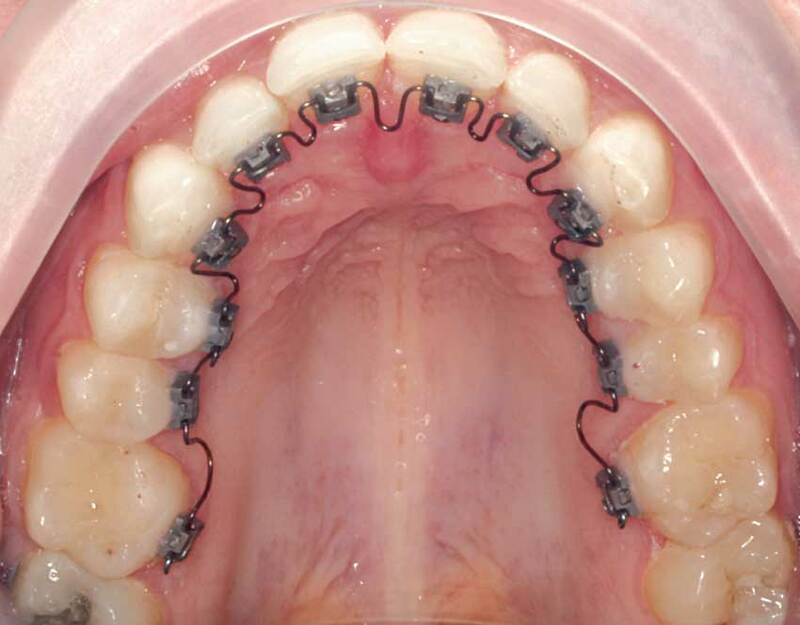 And just like with traditional braces, a retainer is always worn once lingual or labial braces come off. That’s because teeth never stop changing position: Their movement is a simple biological process like hair growth. In that sense, a retainer can be considered the only true anti-aging device! There is no specific type of retainer that goes with lingual braces. You might get a removable clear retainer that looks like an aligner, or one with a thin metal wire across the front of the teeth, or a bonded retainer that is glued to the back of the teeth. Any of them, if used as directed, will keep your teeth in their new and improved positions, although a small amount of natural tooth movement is normal and to be expected. Lingual orthodontics is becoming more widely available as more orthodontists receive training in this specialized technique. If you would like to learn more about lingual braces, please talk to your orthodontist or visit the website of the American Lingual Orthodontic Association at www.lingualbraces.org.